I know this is the 6V thead, but Don, can you still build/offer the 3V Makai? Yes, the Makai is available on either a 1x123, 2x123 or 2xAA battery pak with corresponding LE. I have been using Krytox and more recently Christo lube which is a similar synthetic lube. You can use just about any non petroleum based lube like silicone grease if you want. Nyogel is petroleum-based; you'd need to replace the O-rings before you could use it. I sell a lube I humorously named TiTi Twister, which is essentially Krytox with a molybdenum di-sulfide additive to minimize direct contact between the threads. I have a sale thread on CPFMarketplace, under the "WTS: Misc" section. For the sake of not derailing this thread, please look there for more details if you're interested. Payment sent for one makai 6v 2x123 as per our emails. I have used titi twister on McGizmo lights and my other Ti lights...two thumbs up! I recently ran the Makai 6v using 2 x IMR18350 in an e-series 18650 body. The length was little tight and dented the batteries a bit but this things runs without a problem....Just thought I'd share. Incredibly happy with quality and performance of this thing. Makai 6V XML "Special" on it's way. Yes. After much thought and consideration, I decided that there was one thing needed to make the Makai, or any other McGizmo, functionally better. Don was kind enough to agree to do it... for a nominal charge. I like to think of it as my "tactical" Makai. Meaning single mode hi only? Much higher drive level for all 3 stages? Not sure I would have the nerve to ask Don to fiddle with the electronics. Change the tailcap design for a protruding tactical button? Makai with a red color emitter? What would be tactical about a red led? Anyway, already stated that it's an XML version. Change to tailcap? No way! Won't tease anymore. It's not that big a deal but it was very important to me: bead blast battery pak and head. Unlike Don's past bead blast, there is no cosmetics involved here. No masking. Just a straight bead blast over the entire surface. This serves a couple of purposes. One is that the bead blast surface is much less reflective. 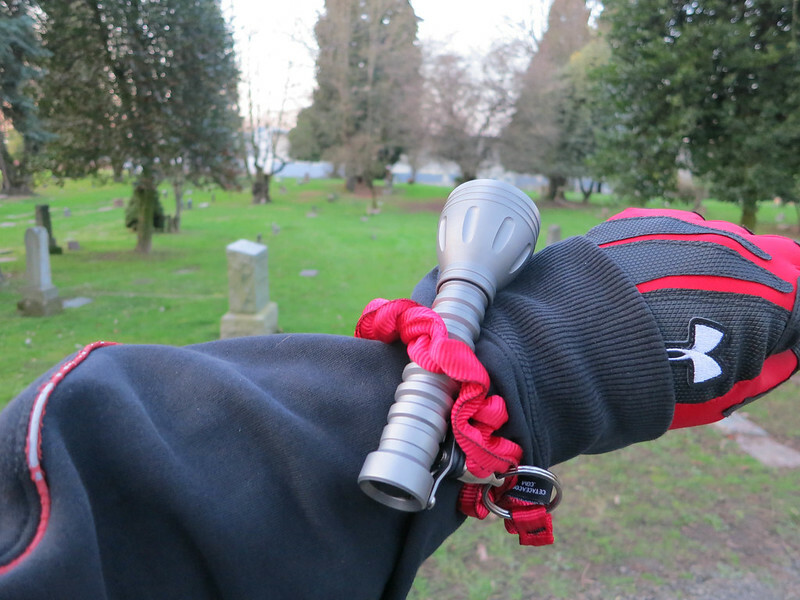 I carry the flashlight on the outside of my jacket (with a McGizmo coiled tether of course.) The polished ti is reflective. The bb ti isn't. I don't want a bright shinny attention-getting metal object on the outside of my jacket. Instead of standing out, the bb surface fades into the background. It also improves the handling. I habitually wear gloves when working outside with Jaqi and there is a significant difference in the feel of the bb surface with gloves on. The bb surface makes for a better grip. My comment to Don was, the rougher the better. Should be here in a day or two. Well, sort of fell into it, since I already had the Haiku and Mule 3V heads, when I decided to get the 6V versions, well, how in the heat of (photo shoot) battle, am I going to tell the difference between the 3 and 6 V versions? The answer was to bead blast the 6V Heads. Don didn't want to go through the time consuming masking process but all I wanted was a straight, no hassle, rougher the better, full-surface bead blast. So, as it turns out, without any real thought about it, my EDC, working with the dog, ended up being a bead blasted Haiku 6V head and a standard polished 2x123 pak. I wear it on the outside of my arm, so, it is there to be looked at. The reflective difference between the bb surface and polished surface is dramatic. The polished battery pak is yelling, "look at me, look at me" while the bead blasted Haiku head fades into the background of the jacket sleeve. This also gave me the chance to handle both surfaces while wearing gloves. There is a noticeable difference. The bb surface with gloves has a very good grip. The polished surface is a little less. Sometimes, small things can make a big difference. The idea for a Makai has only recently come about. Jaqi, the Gordon Setter, is a job. 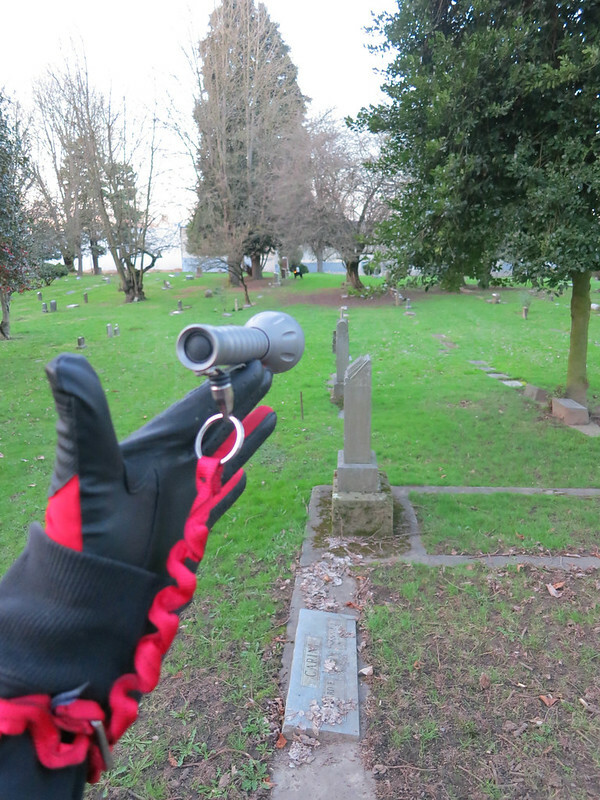 She's a hunting dog and needs lots of daily running work (otherwise, she hunts me in the evening) so we have been going to a local historic cemetery where Jaqi can get a good work out. 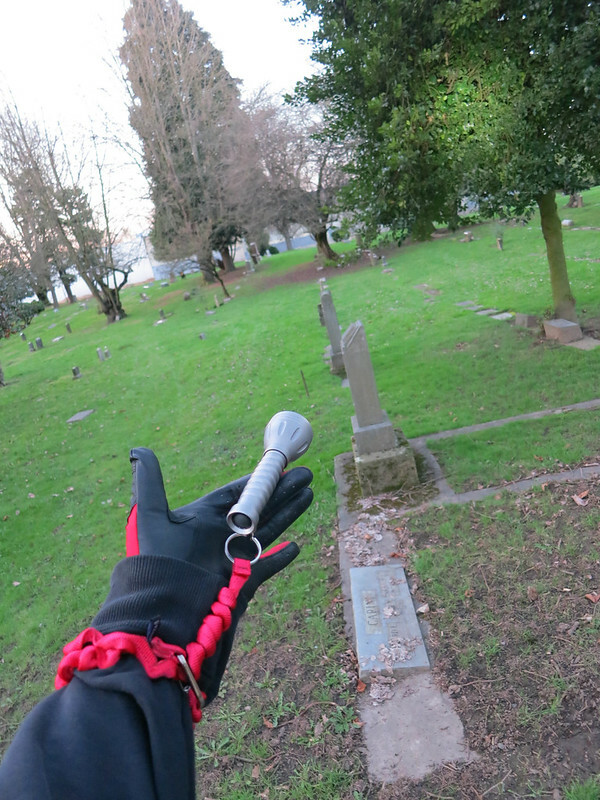 About the only other folks who show up there are the volunteer grounds people, rarely a grieving family member, the creepy cemetery tourists, and junkies, so, out of the clear blue sky, it is Jaqi v. junkies. 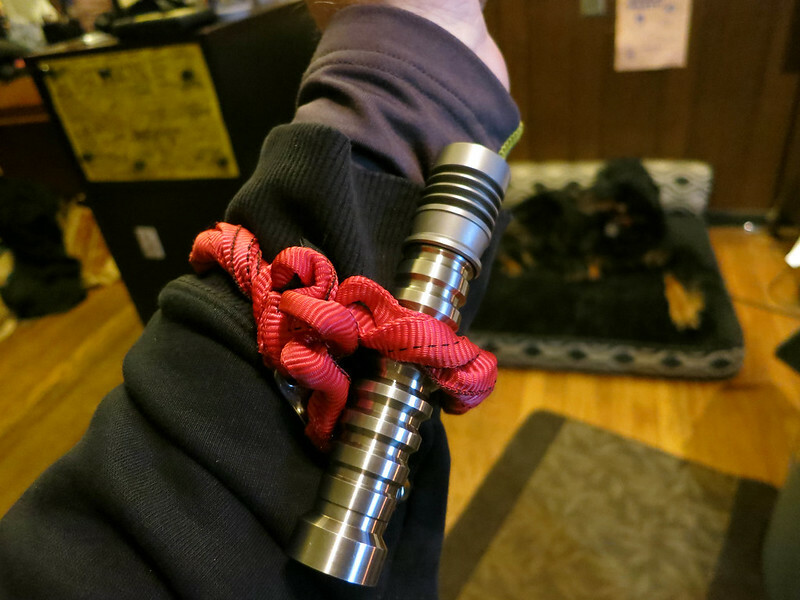 Made it an easy decision to go big with a Makai special "tactical." The Jaqi Makai? Nice rational there. Now why didn't I think of that. One of the drawbacks about handling the Makai with sweaty hands is exactly what you described. Thanks for sharing that. ohh another great thing about Don's 6V LE is, you can power it with a single 4.2V rechargeable. Not that I am suggesting that you do that but in a pinch you could still light it up from a 1X123 pak using a RCR16340. Here's a pic of my EDC with the bb Haiku head and polished battery pak. It's easy to see that the battery pak, in it's shiny glory, is just screaming, "look at me, look at me" The head just sits there. With the Makai head being so much bigger, just couldn't see having such a thing on my arm. Bead blasting makes it just a little bit less obvious that I'm wearing am expensive flashlight on my arm. And, in Jaqi (background) v. Junkies, only the best possible is good enough. Last edited by DTF; 03-06-2013 at 10:47 PM. Hi my fellow makai owners , I wanted to see those who know about batteries and I dunno if Don can jump in to answer this. I have a 6v Makai that I tried to run on a 1x123 pack with a 16340 IMR cell and its ran normally but I just wanted to know if its fine to do so. Don's 6V LE will even light up using a single primary but I don't know how much runtime you will get with that configuration. But certainly a RCR123 will work fine. The "Jaqi" Makai came today. Went right from the box to work. Had to do some investigation in an area where a transient was and it just lit up the area. 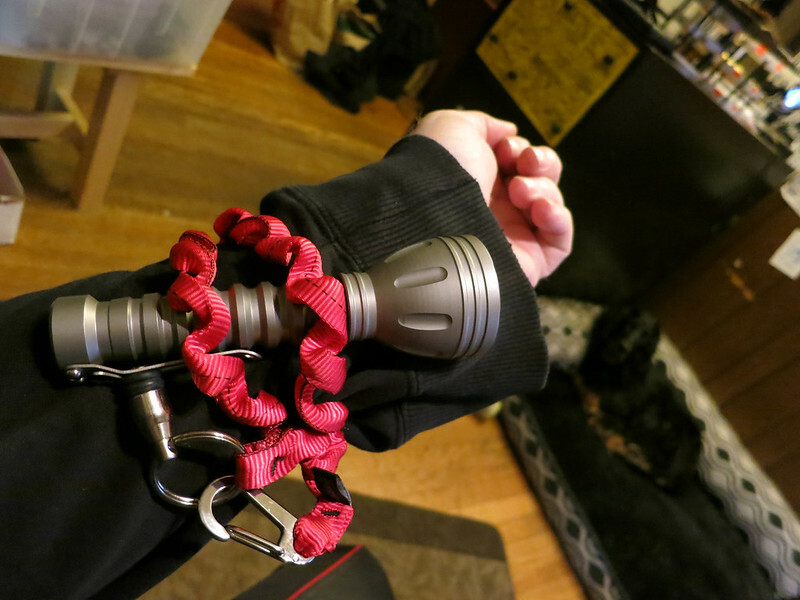 It's heavier than the Haiku so it takes a bit of adjustment to use the coiled tether but was able to find a comfortable fit. The bead blast finish is perfect. Light doesn't look like some expensive piece of metal anymore. Which, in my opinion, makes it a better tool. Last edited by DTF; 03-08-2013 at 08:54 PM. That unique Makai looks good Dean. Pics of Jaqi Makai in action today. Any guess why I got a red tether for it? New and improved coil tether technique. 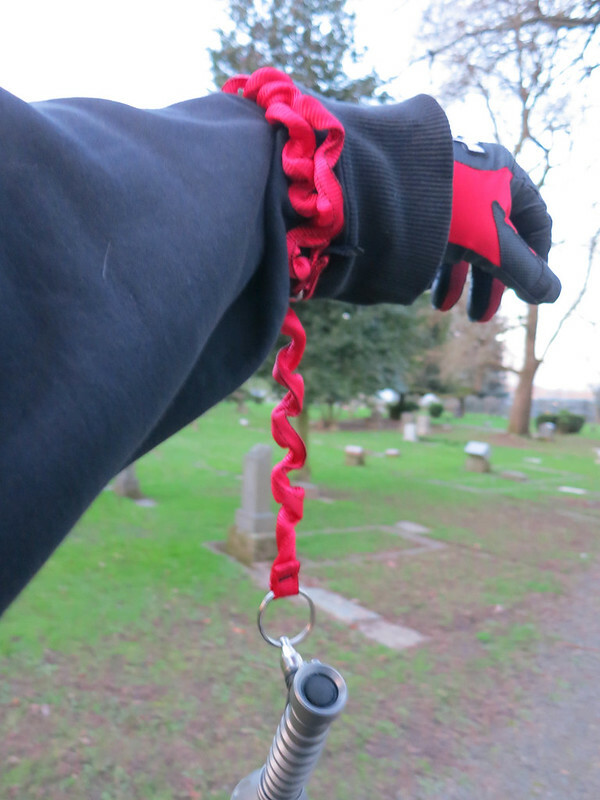 With the extra weight of the Jaqi Makai, needed a better way to work the coiled tether. This new technique seems to work really well. Easy to set tension. Holds configuration very well off the arm. Frees up the flashlight. 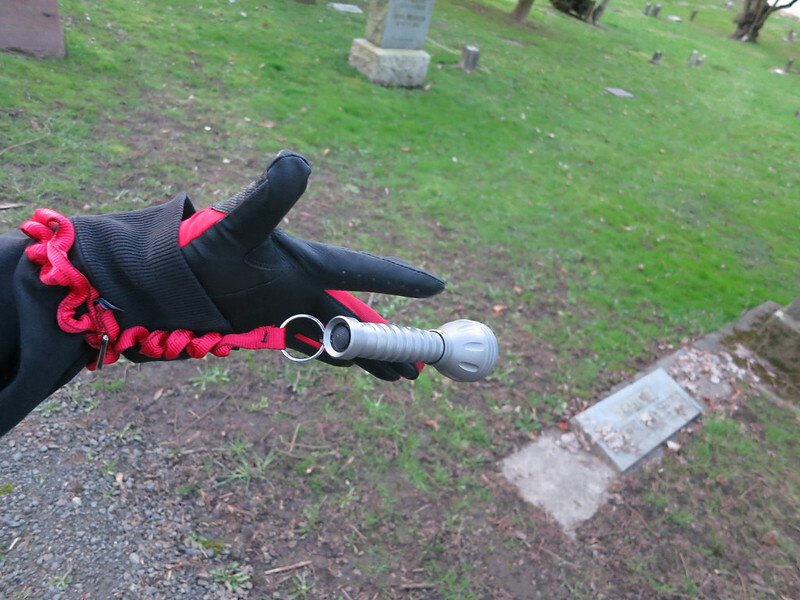 Seems like your red tether is color coded with you gloves and it really jumps at you amongst the greenery around you. The technique you pioneered is very innovative and you are evolving all the time. That is surely one good way to wear you larger and heavier Makai. Don't you just love the chunk of titanium in your hands..
How do you find the beam of the XML in the 6volt light engine? Well, that wall in the distance seen in the picture can be lit up with the Makai. In this 6 acre area, standing the middle, I can light up every corner with ease. The hot spot of the Makai is very impressive. The downside is that everything else I own seems more like toys, now. The Makai does throw a fair bit doesn't it? Especially with the 6V LE which has got a higher drive level. And not to mention the super huge spill beam. Sort of stretches almost the span of our field of view.